Bring your own lawn chair or blanket. Dogs and pets are discouraged. No coolers, bicycles or skateboards allowed. The Irish Fair of Minnesota is held the 2nd weekend of August. The 2019 fair is August 9-11, 2019, and located at Harriet Island in Saint Paul, MN. Admission: What is the cost of admission? Entry to the Irish Fair of Minnesota is free! Age verified wristbands are necessary to consume adult beverages. Wristbands are sold at ID check, and the ticket booths for $2.00. A wristband is not required for soda or water purchases. ATM's Are there ATMs on the grounds? Yes. There are two ATMs on the grounds located near the tickets booths. Bikes: Can I bike to the Irish Fair of Minnesota? Feel free to bike to the IFM, but please know that bicycles are not allowed on the grounds. Bicycle parking is available near the gateway entrance on Water St. We are not responsible for any lost or stolen property and we strongly encourage you to lock your bike. The public dock will be open normal park hours, 7:00am - 10:00 pm. There is no electrical to plug into. For the safety of your pet, you, and our other guests, dogs and pets are discouraged. First aid is located next to the Children's play area. We are currently working with 2019 food vendors. When we have final menus and pricing from each vendor, we will post on our Facebook page. Tickets are sold at the Food and Beverage Ticket Booths located to the immediate left and right inside the main entrance. Tickets are a dollar ($1.00) each. Tickets can be purchased individually. Ticket booths accept cash and credit cards. 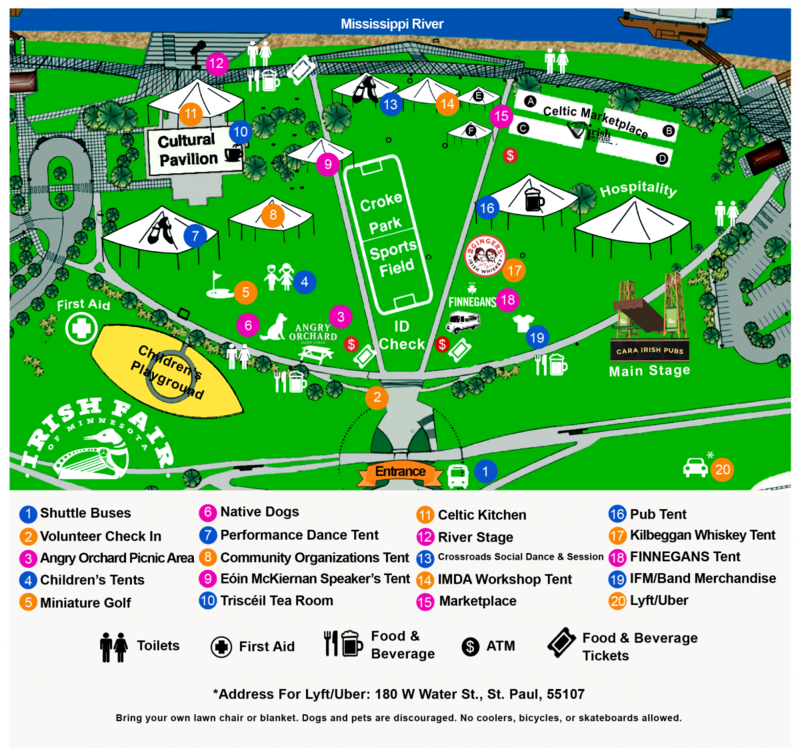 Beer, wine, pop and water are sold in four different locations: Food Court 1, Food Court 2, the Pub Tent, and a tap truck on the river-side of the pavilion. In order to drink alcohol, each adult over 21 years of age must present a valid driver’s license or ID and wear a wristband. Alcohol sales will end 30 minutes prior to closing time each day. Harriet Island is a paved, level surface where wheelchairs can easily navigate on sidewalks. The grass is also level, allowing easy access to tents. Handicapped parking is available on the north side of Water Street between Wabasha and Plato until full. Overflow handicap and transportation is available at 90 West Plato Boulevard. Look for the Handicap Parking Sign. A drop-off area is provided in front of the Gateway Entrance. We apologize for any inconvenience, but the Irish Fair of Minnesota does not offer wheelchairs at this time. Lost and found is located at the Welcome Booth directly in front of the main entrance. After the festival, all remaining items are brought to the Irish Fair of Minnesota office. Call 651-645-0221 or email info@irishfair.com during regular business hours to see if your lost item was turned in. For the safety of your animal, yourself, and our other guests, PLEASE leave your dog and other pets at home. Age verified wristbands are necessary to consume adult beverages. Wristbands are sold at ID check, and the ticket booths for $2.00. A wristband is not required for soda or water purchases.